This project was commissioned by Dr. Mark Ponzo, trumpet professor at Northern Illinois University, who obviously has a passion for the history and performance of soprano brass instruments in all forms and styles and to share this with his students. I actually suggested this one to him in a discussion of future possibilities. 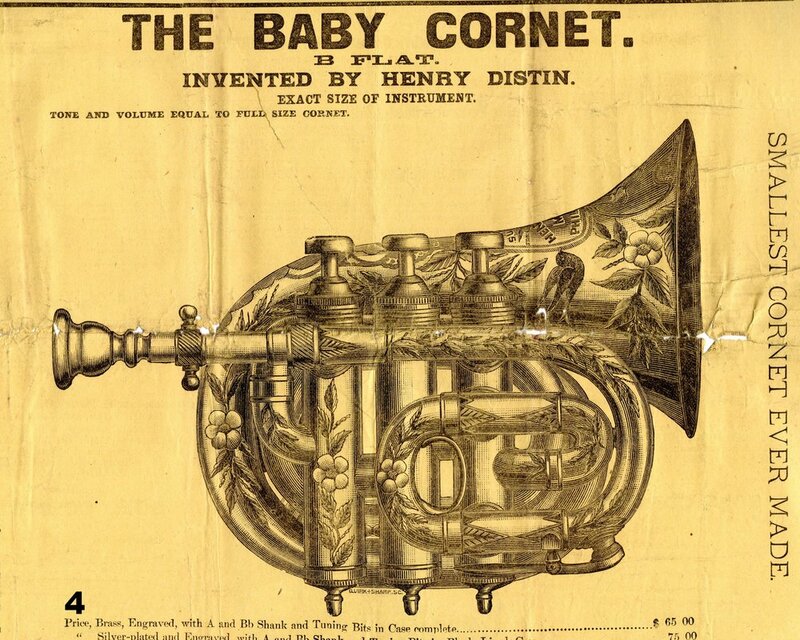 There is only one known "Baby" Bb pocket cornet made by Henry Distin known to exist and it had famously been won by Herbert L. Clarke in a solo competition in 1886, when he was 19 years old. Clarke kept this treasure his entire life and it now resides in the Sousa Archives and Center for American Music at the University of Illinois at Champaign-Urbana. I first got the idea for this instrument while talking to Nick DeCarlis, the world's expert on pocket cornets. Among several Distin parts cornets that I had at that time was one originally made in Philadelphia in about 1888. What made this particular cornet different than any other by Distin full size Bb cornet that I've come across, is that it has fixed valve guides, rather than the three point floating valve guides that he started using in the 1850s. I knew that I could shorten the balusters, as I had done in the Besson pocket cornet conversion, making the valve casings approximately as short as the originals. As in that project, the routing of the valve slide tubing was not the same as in the original pocket instrument, making it impossible to make this an exact replica and there are a few other differences as well. The bell on the original was a little smaller through the taper than a full size Bb cornet, which is the most common practice in pocket cornets and trumpets. I only had access to the full size bell, which made it more difficult to bend into such a small size, but results in a tiny cornet that is full size acoustically. I wasn't able to learn the exact length of the original although in the original catalog page shown on the right, that claims to be full size, measures a bit over 6 inches. The recreation ended up at 5 15/16". Also, the newly re-made instrument plays at A=440hz, while the original is in high pitch. I had re-formed bell flares into ovals in the Caduceus cornets, so I knew that that detail would not be a problem. The rest was a matter of measuring, drawing, trying out ideas, scrapping them and trying again. The valve section is reversed direction from the full size instrument, making the first valve slide tubes very wide. It would not be acceptable to have a slide stick out beyond the length or width of the bell and this detail took some trial and error. The finished slide was the third "finished" part. It is visually more appealing with the crook directed downwards, but can also be inserted upwards, in which case the third slide can easily be drawn out to empty water without disturbing the first slide and the water in the first slide will drain towards the third slide with a quick tilt. The donor cornet was in very rough condition, so after shortening the balusters and removing dents, the valves were plated and refit. Some new tubing was needed to make the bell branch curves, the mouthpipe, some of the tuning slide crooks and tubes. After all the bending and engineering was done, I sent it to Geoffroy Gournet in Easton, PA to be engraved. He re-engraved what little of the original engraving was still visible and engraved the rest with his keen artistic sense. While he couldn't engrave the birds in the same positions on both sides of the bell as on the original, I asked him to fit them where he could, if at all possible. Needless to say, they are beautifully done. After getting it back, I re-mounted the bell and gave it a final polishing before sending it off to be plated. The ninth photo shows the original cornet before starting and the photo before that shows the finished product among all the original parts that were not used. After all this work and expense, I assumed that nobody else would be serious enough to have me make another, but Markus Ellecosta of the Sud Tirol region of northern Italy contacted me after seeing this page. I explained to him that I didn't have and was very unlikely to find another original Distin cornet with fixed valve guides, that would allow me to shorten the ballesters. The options would be to have a new valve section made or find some other antique with a donor valve section. After looking through a pile of parts horns, I realized that the best quality old cornets with fixed valve guides would be by Besson and I have an ample supply of those in various states. The very last photo shows the two parts horns before I got started. The three photos before that show the finished cornet. As you can see, the different valve section design necessitated very different routing of the valve loops. It all came out very well in the end and the first valve slide is actually closer to the original Distin Baby than my first version. Once again, Geoffroy Gornet did a lovely job of engraving this project, including adding the birds to both sides of the bell flare as on the original and my first recreation.